It’s always wonderful to land in sunny, warm Austin in the middle of the Boston winter. This year was especially nice because a large nor’easter snow storm dropped about a foot of snow on Boston while I was in Texas for SXSWedu. But I don’t go to SXSWedu for the weather. In fact, I spend very little time outdoors during the conference. It’s all spent in the convention center rooms, hotel ballrooms, meeting rooms and the line at Starbucks. 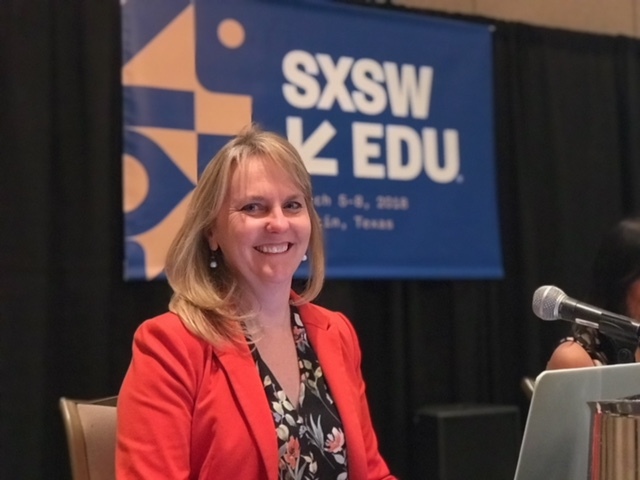 This year’s SXSWedu had an eclectic mix of sessions on topics from artificial intelligence and virtual reality to a first grader sharing meditation strategies from the classroom. The conference features something we at Listenwise really care about: real stories. Our friends at The Moth brought real teachers and their stories to the forefront of the conference which was really unique. With their session, The Moth kicked off a week of new ideas, new strategies, and new tech discussions. That’s what makes SXSWedu so different and powerful from other education conferences–it’s that mix of all the different types of content and topics that educators and educational companies can engage in. Because it’s not subject specific or tech specific, the conference attracts a wide variety of education leaders who want to talk about pedagogy as well as trends, and it has an overall sense of positivity about the innovations happening throughout many facets of education. There’s not a lot about the business of education, but there is a lot of business going on at SXSWedu. Most of it happening in the lobby of the Hilton Hotel. A collection of comfortable chairs serve as temporary meeting rooms between entrepreneurs and publishing houses. I also spent time in the Innovation Hub, where Listenwise had a booth. There, a mix of teachers, administrators, and industry scouts strolled by on a regular basis. One day I needed a coffee break from the booth. I went down to the Hilton lobby and stood in the exceptionally long line at Starbucks to get an afternoon caffeine pick up. Behind me, I met and ended up talking with a potential partner from another ed-tech company. By the time I got my latte, I spotted a mentor from Boston I hadn’t seen in a few years. I got back in the coffee line with her to catch up on her move to a new education company. The company is expanding its offerings and might have interest in adding listening skills to its product. We went through the line together talking as she ordered her tea. When she left, I saw another potential business partner I hadn’t seen in a year sipping coffee at a table, so I sat down at caught up. My coffee break ended up being more than an hour long and full of opportunities. That sums up SXSWedu: Your learning, your experiences, your best encounters happen outside the sessions and keynotes. With the ASU GSV conference coming up on April 16th, this is super-timely advice! Most of the connections at ASU GSV occur during the networking events and evening shindigs.